The Golden Portal: The team behind TEDxRVA is involved with a new art project that allows Richmonders to talk to the world | Arts and Culture | Style Weekly - Richmond, VA local news, arts, and events. 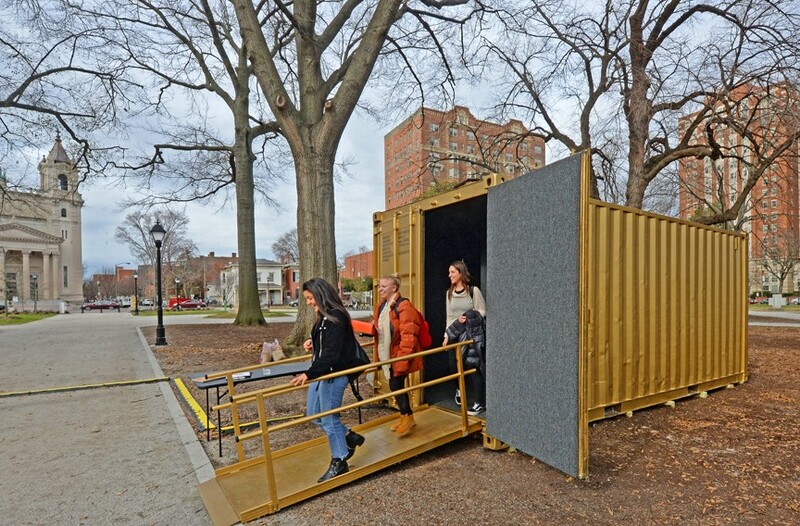 A big, golden shipping container recently appeared in Monroe Park that left many curious onlookers wondering: Just what is this thing? Sans-serif words are printed on the side that clue visitors to its purpose: "This gold container equipped with immersive audiovisual technology is a portal. When you enter, you come face-to-face with someone in a distant portal and can converse as if in the same room. RSVP and learn more at www.sharedstudios.com." Other text — shipping codes and geographical locations — remains slightly visible under gold paint. Brooklyn-based Shared Studios, a for-profit company co-founded by Michelle Moghtader and Amar C. Bakshi, launched the portal project in 2014. The first pair of portals connected people from a gallery in New York to people in Tehran, Iran, through a shared video feed. 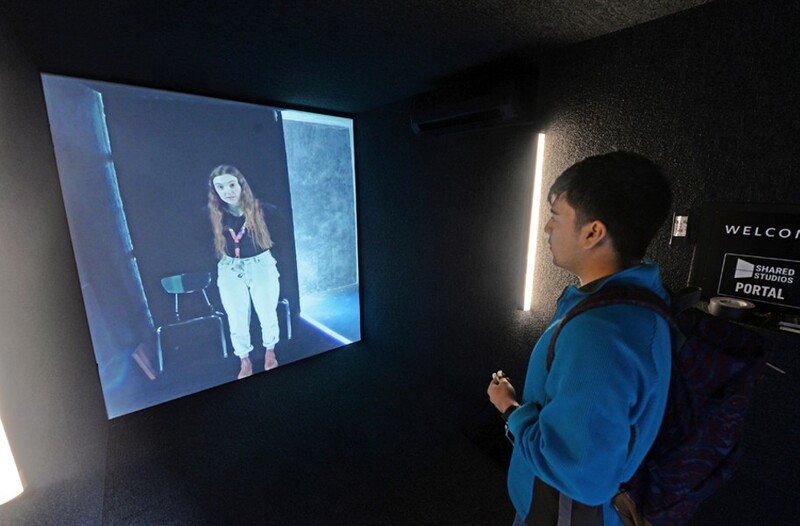 The interior of each portal is padded with wall-to-wall gray carpet except for the back wall that features a full video screen meant to provide an immersive experience so that a seamless environment seems to connect the locations. Portals are connected by Wi-Fi to one another for real-time video conversations. The idea is to break down barriers between groups of people who have little interaction or only think of another culture in a negative light. "When you see Iraq in the news, it's always seemingly destroyed," points out Moghtader. "People aren't studying and singing and playing music, whereas in our portal this happens all the time." The portal project is in Richmond thanks to Andy Stefanovich, a Detroit transplant who has lived in the Fan since 1990 and who first brought the TEDxRVA conference here in 2012. He explains that he first experienced the portal project at the national TED —short for technology, entertainment, and design—conference in Vancouver in 2017. "I walked up to it and had, just what [response] everyone would have: What is it and what happens inside?" Stefanovich says. "I engaged with it and I immediately became enamored with all of its power and all of its magic. … Three or four months ago [I] just said, we as a city and we as a region need it." While some portals like the one in Richmond are privately funded, others are maintained by grants. Stefanovich, who is footing the bill for this portal, thinks of it as "an investment in us as a community." Shared Studios boasts portals in 41 sites, from domestic locations such as Boston to a Syrian refugee camp and other global communities. Some containers are in major cities while others sit on university campuses or are housed in underprivileged areas, including a Milwaukee neighborhood with the nation's highest mass incarceration rate. And there are big plans for growth, according to Richmond portal ambassador Karen Manning. "[Shared Studios is] bringing one to three of these online a month this year," she says. Growth has been organic and initiated by people from the various communities, Moghtader explains, but every portal must have reliable internet and electricity, a shipping container and a space. Also, Shared Studios is considering opportunities for business meetings and connectivity for large multisite corporations with people working around the world. Beginning Jan. 29, the portal will be open weekly for 10-15 hours for walk-ins or free timed reservations. Visitors might sign up for an activity, such as yoga, a book club or a dinner. Or some visitors might encounter a conversation prompt such as "What inspired you today?" and then have the opportunity to discuss their thoughts with people in the portal. People can also submit ideas for events to be held in the portal. Until April 30 the Richmond portal remains at Monroe Park, but as part of its River City tour, it will move to three other local sites over the course of one year. Stefanovich intends for the portal to connect with students in the Richmond Public Schools, Communities in Schools of Richmond, Art 180, and other local art and educational organizations. He paints a vivid picture: "You walk in during those time frames and there will be someone on the other side in that portal in that city and you just have … a conversation that is, you know, free of filters, of lenses, of biases, all the things that may be in the way of us having an authentic, candid, free beautiful conversation. And that's the power of this thing once you experience it. It's amazing. Fifteen minutes in this and it's almost like you're breathing the same air as the person on the other side of the portal." For information, contact Karen at portalrichmond@gmail.com and to make a reservation and see schedule, visit SharedStudios.com/Richmond after 3 p.m. on Jan. 29.